Cycling4Children.com - This is the update page for the upcoming 2009 Equal Parenting Bike Trek. Information will be added on a regular basis so please visit often! 2009 Equal Parenting Bike Trek - Cycling4Children - Cycling 800 miles for Family Preservation and Equal Parenting Rights. NANCM Cyclist - to be named soon. Lansing Michigan Capitol. Date - coming soon. 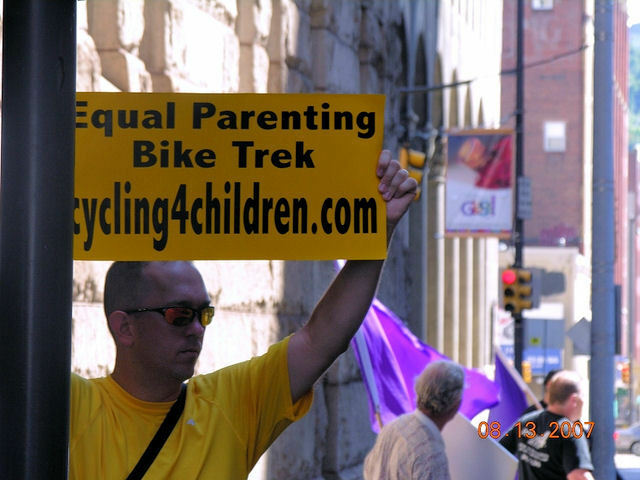 -Dance4Equality will be present at the departure event for the Equal Parenting Bike Trek. 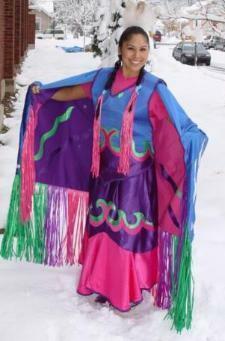 Dance4Equality will be dressed in full American Indian regalia while performing their Pow-wows of song and dance. I am an American living in Switzerland who has gone threw hell trying to visit my son. I married a Swiss woman and our marriage didn't work out so well. The courts do not recognize PAS and my wife has stopped all visitation rights. I am suing the Child welfare service and the judge at the moment. The thing that has kept me together in a foreign country has been my bicycles. When I read the post of the Bike ride for Equal Parenting I jumped for joy but felt sad because I did not have time to prepare for it. I hope that you will allow me to ride with the group in 2009. I don't want to be just a visitor to my son, I want to be his father. I have done much work on human rights in the United Nations and Washington DC. If you need me to contact and arrange meetings in DC with congress I would be happy to give my assistance. "Bill Gibbons - They probably used my picture because of the sign with the name of the event and the website. Believe me when I say this - NOTHING can take away the pride his children will have when he tells his account to his children. They can be proud of this incredible father who we had the honor of housing the night prior to the departure." Rob - this is an incredible journey in which we were able to help Bill prepair for this trip thru fund raising and promotion via the media - as well as last minute running around to every bike shop in our area the weekend before to make sure he had everything for his trip. Bill has been a great friend to me for 15 years and I am very proud of him. Just that our local paper dropped the ball on his picture and they wanted a headshot. It wasnt to take away from you and your incredible event. Talking to Bill he was very upset about this on Tuesday. We are talking to him every morning giving him encouragement, tracking his miles and movement on the GPS site. It is a week of excitement. Even though you arent riding this year - I hope that you do go the rally next week so I can shake your hand. We are all in this together - regardless of state laws, federal laws, and spitefull ex's who use our kids as negotiating pawns. We simply want our kids. This is a trip I hope you will allow me to do for next year. I know you will have stringent requirements as detailed. But with what we have seen Bill do to prepair for 2008 - there is no doubt we can meet the requirements for 2009. May everyone arrive safely on this trip to DC! love the ride, hate the distance. Both in how long and I live in texas. How about making some smaller (metric 100, 30, 4, etc. ) size rides and have them all over the country on the same weekend. More people can ride shorter distances. I took my little 5 year old girl and she rode a 4 mile route all her self on her barbie bike. Get kids involved to since all this is for them. Let them show there support as well. Thanks for doing the Equal Parenting Bike Ride. I am stationed in San Diego and lost my kids while I was deployed in Iraq. I went back to court to fight thinking the system would do the right thing for making mistakes and violating federal law and found out this was far from the truth. I lost my children, home and personal belongings. The courts hide behind this "best interests of children" and used my serving the military as a means of determining that I was unfit because I serve in the military. I would like all of you to contact Paul Reickhoff at paul@iava.org and tell him we need to protect our military brothers and sisters and not let them lose their children. I was wondering if we could extend things and do a global tour, perhaps with a baton or torch being passed throughout the world, as I know this is a global issue. We could contact each group in each country who is battling the same outdated justice systems and get them to join in. We could have a map of the world and a click on each country listing all the organisations fighting the same cause, the right for a child to have two equal, loving nurturing parents and time with both. This is a great cause. Let me know if you're interested in a Dove Release for the event.